Supreme Court has resumed the decaying corpse of memo gate case for one last flogging. Announced on Thursday that SC has issued arrest warrants for the ex-Ambassador and a request has been delivered to Interpol for ‘red warrants’ against him. This is nothing new as the same performance was given in 2012 also. This time, however, the script writers seem to be setting the Supreme Court up to play the fool. 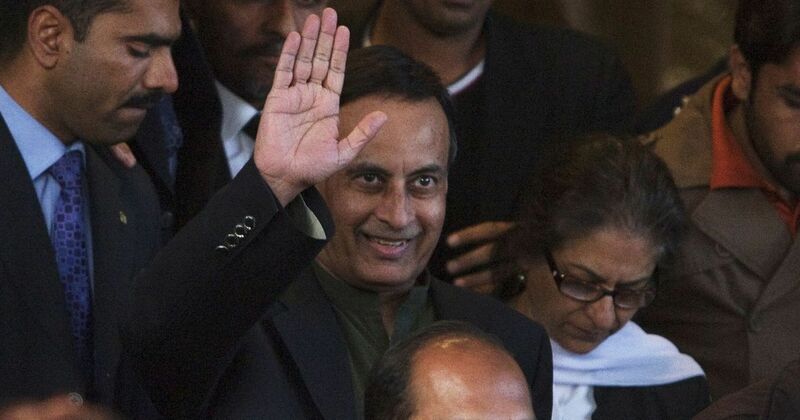 More recently, Haqqani’s name had echoed in the apex court while a three-judge bench heard a set of petitions moved by PTI chief Imran Khan and a group of citizens in connection with the right of overseas Pakistanis to participate in the democratic process. The case had reminded the chief justice of Haqqani. “Should we also give him the right to vote?” the chief justice had wondered. “Why don’t we issue him [Haqqani] a notice and summon him to face the Memogate case,” the chief justice had then said. Later, while reviewing previous progress on the case, the bench had observed that, following his resignation, Haqqani had left the country on the assurance that he would return, but never did. So we are told that whole case was completely forgotten by the Chief Justice like an aging, absent minded uncle until listening about voting rights of overseas Pakistanis? Is this what will be explained to Interpol when they ask why there is a new request after five years? We forgot? And Interpol will take this seriously? Actually, there is already a problem with Interpol taking our requests seriously, isn’t there? Already last year Interpol rejected FIA’s request for a ‘red warrant’ against Altaf Hussain. Next Interpol rejected FIA’s request for a ‘red warrant’ against Brahumdagh Bugti. It should also be noted that Interpol has rejected FIA’s request for a ‘red warrant’ against Gen. Musharraf. Actually, Interpol rejected this request not once – but three separate times! Speaking of Musharraf, has the Court forgotten about him upon suddenly remembering Haqqani? Is it that our Justices are only able to remember one case at a time? The futility of requesting ‘red warrants’ against political opponents is obviously no secret. International law experts have also already noted that it is impossible to legally force Haqqani to return against his will. If not, why doesn’t the government appeal to US authorities for mutual assistance? 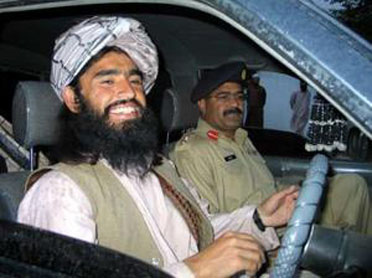 Legal experts have explained that “A request for mutual assistance between law enforcement authorities will, in any case, have to go through a U.S. court where the Pakistan government will need to prove that a crime has been committed,” adding that “Even if Haqqani is belatedly charged with something other than treason, his lawyers in the U.S. or any other country will claim that the charge is ‘a relative political offence'”. Whatever narrative they have tried to create within Pakistan, the rest of the world simply doesn’t buy it. So what is the point of the SC’s latest action unless it is only to generate breaking news tickers for Pakistani media? And why have our Justices suddenly remembered this forgotten affair? Could it be because we are once again facing serious threats of international isolation? Is it purely by coincidence that this announcement is made soon after it is reported that US, UK, Germany and France have moved to place Pakistan on the global terrorist-funding watch list? 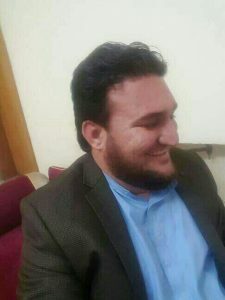 Perhaps our esteemed Justices could do some good for the country and remember another forgotten case – the case of Ehsanullah Ehsan, an actual traitor who has actually waged war against Pakistan and is responsible for killing actual Pakistanis. I promise, they will get some headlines from remembering this, too! Are extremists are becoming mainstream, or the mainstream is becoming extremist? With his appearance, the Pakistani Army seemed to be sending this message: You can kill thousands of Pakistanis, but if you later testify that you hate India as much as we do, everything will be forgiven. 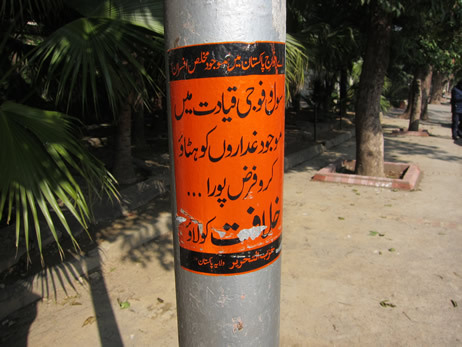 It’s not just anti-India message that the TTP leader was giving, though, it was more. In his ‘confession,’ Ehsanullah Ehsan even pointed a finger at Israel. The narrative here, to use the Army’s favourite expression, is not that militancy is illegitimate, it’s that these militants are illegitimate. However, after this fiasco blew up in ISPR’s face, they were given a second chance. Ehsanullah Ehsan is hard to feel pity for. He is the same who was gladly announcing the brutal massacre of children at APS Peshawar. As he is ushered off the stage, though, the second performer steps into the spotlight. Like Ehsanullah Ehsan, Noreen was also involved in terrorism. However, her target were Christians, and she did not get the chance to carry out her evil plans. Now that she has been captured, she has realised her mistake. Noreen’s confession is not as detailed as the confession of Ehsanullah Ehsan, but her role is different. A medical student, Noreen has pointed a finger at social media. You see, this is how she was radicalised. Social media. On the internet. Not in our own society. Noreen Leghari is the anti-Malala. She was not resisting radicalisation, she was gladly radicalised. She was not an innocent victim of extremists, she was an extremist. Only she got carried away. It could happen to anyone, even a bright university student. Noreen Leghari was arrested only two weeks ago in a raid on a Daesh hideout. During her two weeks in custody, she has been deradicalised. She is not working with human rights NGOs, she is working with Army. She is not giving speeches on problems in Pakistani society in foreign cities, she is giving interviews here about dangers of social media and external threats to Pakistan. And she is not denouncing jihad. She is denouncing misguided jihad. In other words, it is the difference of ‘bad‘ jihadi vs ‘good’ jihadi. Apologists explain that Army is that by mainstreaming extremists like these two, we will set off a chain reaction and other extremists will be mainstreamed also. What is not clear, though, is what is our definition of ‘extremist’. Until we know this, how can we know whether extremists are becoming mainstream, or the mainstream is becoming extremist. Parliament is about to begin debating new terms for cooperation with America in the war on terrorism, but this is issue is anything but new. Actually, it seems like everyone has an opinion on whether and how we should engage with the Americans – from the Difa-e-Pakistan chants of “Go America Go” to the reasoned calls for parliamentarians to “put interests ahead of emotions” and everything in between. But while everyone is focused on what new ‘red lines’ will define new talks with America, we may be ignoring a covert war against Pakistan happening right under our noses. Claims that hidden hands are waging a cover war against Pakistan are nothing new. Opinion-makers writing in major newspapers and appearing on TV talk shows have been telling about this conspiracy for years. Recently, a retired military officer (naturally) wrote a typical piece in The Nation that describes the common narrative. Ever since the US/Isaf forces ousted the pro-Pakistan Taliban government from Afghanistan, and the pro-Indian Northern Alliance dominated the government, India’s notorious intelligence agency, the RAW, has become fully entrenched in the war-torn country. Backed by the Afghan Intelligence Agency and allegedly supported by the Mossad, CIA and others, it is aiding and abetting insurgency in Balochistan, FATA and our urban centres. Their common goal seems to be to internally destabilise Pakistan to its ultimate disintegration. Claims of a Mossad-RAW-CIA-KHAD nexus bent on disintegrating Pakistan have reliably served certain sections of society for decades. Actually, this story is so old that one can’t help but wonder if we really have anything to worry about since these powerful agencies can’t manage to get the job done. But the fact is that we do have something to worry about because there really is a covert war against Pakistan. Only it’s not being carried out by a secret Mossad-RAW-CIA-KHAD conspiracy. Taking place right now is a field general court martial of Brigadier Ali Khan who is accused of conspiring to topple the government, trying to instigate a mutiny within the army and planning an attack on the GHQ. These are serious charges of treason against the state. And Brig Ali was not some lone wolf who hatched a crazy scheme on his own – the allegations against him involve ties to the group Hizb-ut-Tahrir, an international group dedicated to the overthrow of sovereign governments to form a new Khalifat. 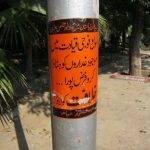 Hizb-ut-Tahrir, though banned in Pakistan, is openly recruiting and plotting against the state. Recently, 21 activists were taken into custody from a meeting in Islamabad. According to Brigadier Amir Riaz, head of 111 Brigade, Hizb-ut-Tahrir “has prepared a new constitution and a shadow government for Pakistan and that the group was ready to take over anytime”. Most people shrug off this sort of news saying that such groups are such a small minority that they pose no real threat. But what about when the Jamaat-e-Islami chief himself terms Osama bin Laden as ‘the greatest martyr’ and officials democratically elected by the people of Pakistan as ‘beasts’? 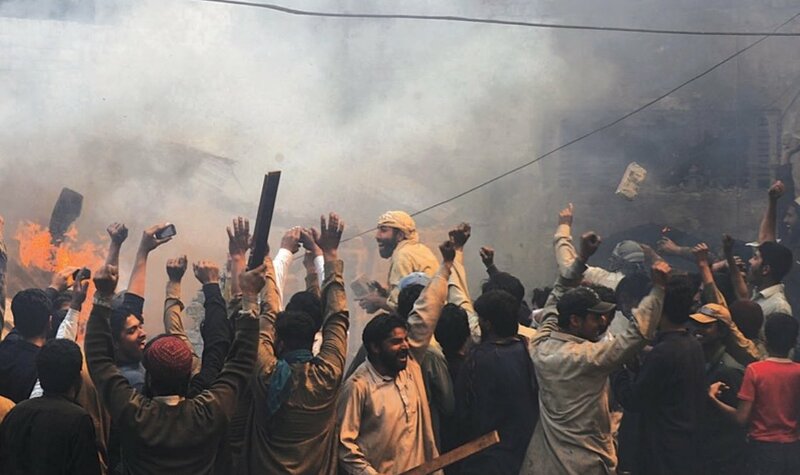 Besides, small groups can have an outsized effect, as Jamaat-e-Islami has proven time and again when they take to the streets since they can’t win at the ballot box. And while Hizb-ut-Tahrir might insist that they are a “peaceful” group (though this raises the question why they are so intent on recruiting in the military), others make no attempt to hide their aims. Last week, security forces in Bajaur Agency seized heavy weapons worth millions of rupees from secret hideouts of terrorists. People will again shrug off this news by claiming that these weapons are for killing Americans in Afghanistan, not Pakistanis. This, of course, ignores the obvious problem of where these heavily armed militants will turn once the Americans leave – a change that is getting closer every day. It also ignores the open threats made by militant groups against Pakistan. 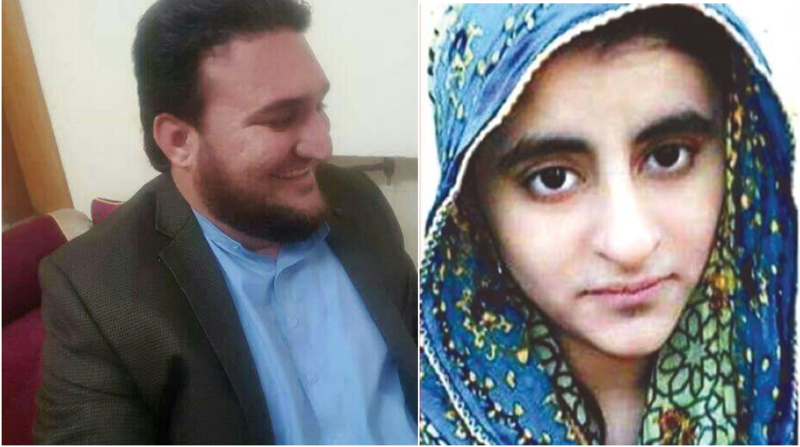 The Jamaat-e-Islami chief is not the only extremist who sees the terrorist Osama bin Laden as a hero, and Taliban spokesman Ehsanullah Ehsan openly threatened attacks against the state if bin Laden’s widows are not released from Pakistani custody. “If the family of Osama bin Laden is not released as soon as possible, we will attack the judges, the lawyers and the security officials involved in their trial,” Ehsanullah Ehsan of the Tehrik-e-Taliban Pakistan (TTP) told Reuters. The Difa-e-Pakistan has threatened force against the state also, threatening to “hold a siege of Parliament House” if the democratically-elected government re-opens NATO supply routes. And once again, familiar faces are making the threats. 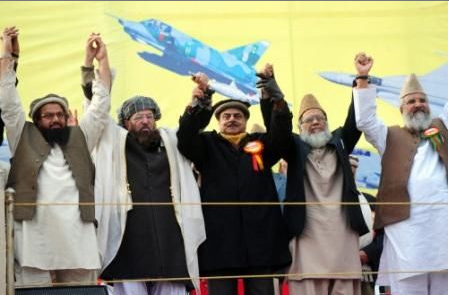 The sit-in was addressed by Jamaat-e-Islami (JI) Ameer Syed Munawwar Hassan, JUI-S chief Maulana Samiul Haq, former ISI DG Lt Gen (R) Hamid Gul, former minister Ijazul Haq, JI secretary general Liaquat Baloch and Hafiz Abdul Rehman Makki of Jamaatud Daawa (JuD). All of this is news that should shock the public, but instead it passes almost unnoticed. You don’t have to believe in hidden hands and secret global conspiracies to make sense of this news. It’s all quite plainly laid out before us. There are militant groups who want to overthrow the government of Pakistan because the majority of people do not accept their worldview. These are the millions of Pakistanis who do not believe Osama bin Laden is “the greatest martyr” and do not support suicide bombings. They are the millions of Pakistanis who believe that the civilised people don’t threaten a siege of parliament if they don’t get their way, they contest elections and try to convince their fellow citizens with reason, not threats. This is the tragic irony of our times. 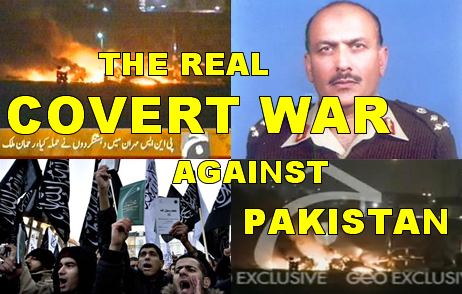 Newspapers, TV talk shows and street gossip is filled with chatter about a covert war being carried out with the aim of destabilising and ultimately disintegrating Pakistan. But we have become so fixated on fantastic tales of external enemies and their invisible foreign hands that we have failed to notice the real threat, and so we are paralysed to do anything about it. Parliament will debate new terms of engagement with America, the judiciary will continue chasing memos and BBMs, and retired officers will continue weaving thrilling tales of international intrigue and selling them to media more concerned with ratings than facts. Meanwhile, forces are amassing against Pakistan not in US think tanks, but in dhabas and on verandas in our own cities and villages. Will we wake up in time to avert this tragedy and recognise the real enemy among us? If questions about sovereignty were merely political weapons to be made during the KL debate, the American operation in Abbottabad has put them into start reality. The Americans may have killed their man and left, but the operation highlighted some more disturbing points such as how did the world’s most wanted terrorist mastermind get into and live in Pakistan for years without notice? And if the Americans can enter and leave Pakistan without notice, how secure are we actually? The problem is not only that Hizb-ut-Tahrir is banned, therefore the members of this group are choosing to break the very laws they are meant to protect, rather it is something much deeper. The stated goal of Hizb-ut-Tahrir is for all Muslim countries to unify under a Khalifa. That means that supporters of Hizb-ut-Tahrir are by definition anti-Pakistan. For all the worry about sovereignty, it is Hizb-ut-Tahrir that believes that Pakistan does not deserve sovereignty but should be subservient to a foreign dictator (Khaliph). How can members of Hizb-ut-Tahrir be soldiers sworn to defend Pakistan if they do not believe Pakistan should exist? There are some journalists and media celebrities who are defending these arrested officers and trying to claim that it is an attack on Islamic ideology, but this is fundamentally incorrect. Neither is it simply a matter of technicalities. When the Taliban spokesman Ehsanullah Ehsan spoke to the media to take credit for the suicide bombing on a police station over the weekend, he bragged that it was carried out by “Uzbek nationals”. This means that Pakistan’s sovereignty was violated once again by foreign agents crossing our borders and carrying out attacks on our security services. As usual, the Ghairat Brigade is silent on this fact. We have sacrificed too much for this country to let it be slowly eroded away. We should be vigilant about protecting our sovereignty from violation by larger powers like India and US, but in doing so we should not ignore what is going on underneath our very nose.